Be the first to share your favorite memory, photo or story of ANDREW. This memorial page is dedicated for family, friends and future generations to celebrate the life of their loved one. 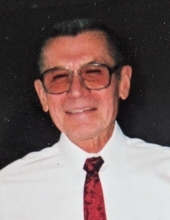 ANDREW D. RERKO, age 85. Beloved husband of the late Joanne (nee Vetter); Dear father of Andrew F. (Linda), Charlotte (Peggy), Donna Quinn (Mike), Dale (Eileen), Joseph (Allison), Dennis and Florence Kulina (Todd). Loving grandfather of 19; Great-grandfather of 9; Brother of Agnes DelGrosso (deceased) (Patrick), Ronald (Emily), Kenneth (Carole), and Rosemary Grace. Andy and his wife, Joanne, were the owners of Elmwood Home Bakery for over 60 years. U.S. Army Veteran. Passed away Sunday, February 3, 2019. Funeral Mass Our Lady of Angels, 3644 Rocky River Drive, Monday February 11, at 11:30 AM. Interment Resthaven Memory Garden, Avon. Friends may call in the McGORRAY-HANNA FUNERAL HOME OF LAKEWOOD 14133 DETROIT AVE. Monday 10:00 – 11:00 AM. In lieu of flowers family suggests memorial contributions to Crossroads Hospice 9775 Rockside Rd. Suite 270 Valley View, OH 44125. "Email Address" would like to share the life celebration of ANDREW D. RERKO. Click on the "link" to go to share a favorite memory or leave a condolence message for the family.